Homilies are now available to download and listen to! As part of our answering the challenge of the Holy Father to go out and evangelize utilizing new technologies, we're now offering the homily each week for download. Clicking the link to the homily should download it and automatically start it playing in whatever music player your computer is set up with. On the technical side, the file sizes are about 5 megs which means it may a minute or two to download on slower Internet connections. It is also an MP3 formatted file which means that these are essentially podcasts. Don't worry if all the technical words don't mean much to you. It means we're using the latest in technology in order to make sure our church parish can reach the most people. The current week's homily is available on a link on the front page of the website next to the link for the current week's bulletin. On the page with the prior bulletins, the corresponding homily will be sitting side by side with its bulletin. We started on the anniversary of the start of the Catholic Church, Pentecost Sunday --- two years ago. This week, the Twenty Second Sunday in Ordinary Time, is our one hundred and forty second! podcast to be posted. The homily is given by Father James Brady. So, take a listen and let us know what you think. Click here to download the Twenty Second Sunday in Ordinary Time homily from St. Landry Catholic Church, Opelousas, Louisiana. The Lieutenant Father Joseph Verbis Lafleur Memorial Mass will be at 6:30 PM, September 7, 2011 on the anniversary of Father Lafleur’s death at St. Landry Catholic Church, 1020 North Main Street, Opelousas, Louisiana. The mass will be celebrated by Abbott Justin Brown, O.S.B., St. Joseph's Seminary, St. Benedict, Louisiana. For the last several years, St. Landry Catholic Church has hosted this annual Mass in honor of one of its former altar boys; it was, in fact, through the help and guidance of the pastor, Father A. B. Colliard, that a young Lafleur was eventually able to enter the seminary. 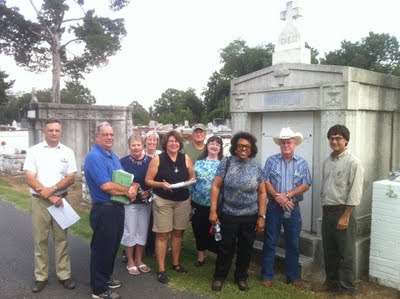 Today, some of Father Lafleur’s relatives in the Opelousas area are still parishioners of St. Landry Catholic Church. In 2007, a monument in honor of his memory was erected on the church grounds. After being ordained to the priesthood in 1938, Father Lafleur went on to serve both his church and his country as a military chaplain during World War II. He and more than 600 other prisoners were killed when the Japanese ship transporting them was torpedoed. Although Father Lafleur’s body was never recovered, survivors later recalled that he was last seen trying to help others escape from the sinking vessel. In the years that followed, Father Lafleur’s family received letters from many others to whom he had ministered during the war, sharing their stories of how deeply the priest’s selfless actions touched and inspired them. In October 2008, Lieutenant Colonel Peter Joseph Guerra assisted the Lafleur family in submitting a request to the U.S. Army, asking that Father Lafleur be considered for the Medal of Honor. While the family is still awaiting a decision on that matter, Lt. Col. Guerra has authored a book which chronicles Father Lafleur’s heroic endeavors as a military chaplain. Those who are interested in learning more about Father Lafleur are encouraged to visit http://www.fatherlafleur.org/ for further information. The bulletin for the week of August 28, 2011 has been posted. Click here to see it. The calendar on the website has been updated with all events for the coming week along with prayer intention information and information on the second collection for all of the masses. Take some time to look at our calendar here. Updates are also being made to our St. Landry Catholic Church blog. You can get to the blog from the church home page under the Bulletins and News section or you can just click here to go to it. Don't forget, we're also sending out live updates via Twitter. Our Twitter name is StLandryCath. You can see updates by clicking here. And we're also on Facebook --- friend us! You can see our updates on our page StLandryCatholicChurch. The current week's homily is available on a link on the front page of the website next to the link for the current week's bulletin. On the page with the prior bulletins, the corresponding homily will be sitting side by side with its bulletin. We started on the anniversary of the start of the Catholic Church, Pentecost Sunday --- two years ago. This week, the Twenty First Sunday in Ordinary Time, is our one hundred and forty first! podcast to be posted. The homily is given by Father James Brady. So, take a listen and let us know what you think. Click here to download the Twenty First Sunday in Ordinary Time homily from St. Landry Catholic Church, Opelousas, Louisiana. St. Landry Catholic Church Cemetery Tours are coming! The bulletin for the week of August 21, 2011 has been posted. Click here to see it. The current week's homily is available on a link on the front page of the website next to the link for the current week's bulletin. On the page with the prior bulletins, the corresponding homily will be sitting side by side with its bulletin. We started on the anniversary of the start of the Catholic Church, Pentecost Sunday --- two years ago. This week, the Twentieth Sunday in Ordinary Time, is our one hundred and fortieth! podcast to be posted. The homily is given by Father James Brady. So, take a listen and let us know what you think. Click here to download the Twentieth Sunday in Ordinary Time homily from St. Landry Catholic Church, Opelousas, Louisiana. The bulletin for the week of August 14, 2011 has been posted. Click here to see it. Registration for the Fall 2011 Semester for the Aquinas Institute begins Monday for Credit Students and the following week for audit students. There will be two great courses this semester, Church History with Dr. Kevin Roberts held on Tuesday evenings at De La Salle in Lafayette and Liturgy with Fr. Bill Blanda, held on Thursday evenings at Our Lady of Fatima in Lafayette. Please do what you can to circulate this information and encourage registration in the AI. Description: An in-depth study of biblical foundations and the theological shape of Catholic worship. Beginning with the theological concept of “liturgy” as participation in the Paschal Mystery of Christ and the life of the Trinity, this course surveys the shape of the liturgy in the Old Testament, in the New Testament, and the current day. Particular attention is paid to the renewal of the liturgy inaugurated by the Second Vatican Council. Description: A general survey of events in the history of the Catholic Church from the 1st Century to the present. Special emphasis will be given to the development of Church’s teachings and practices, as well as the persons who shaped her history and the primary sources that speak of that history. The semester will be divided into three sections. New and current credit students may call the Office of Christian Formation for a registration application from August 8 – 12, 2011. 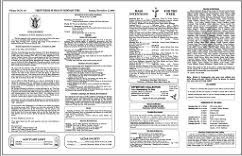 If space is available in the class, the Office of Christian Formation will fax or mail an application form with instructions for registering by mail. All audit students may call the Office of Christian Formation for a registration application from August 15 – 19, 2011. Call 261-5674 for information. The bulletin for the week of August 07, 2011 has been posted. Click here to see it.